Xuanhua Construction Machinery Co., Ltd. (Hereinafter referred to as HBXG) was founded in 1950. HBXG is the pioneer of the track bulldozer manufacture in China. 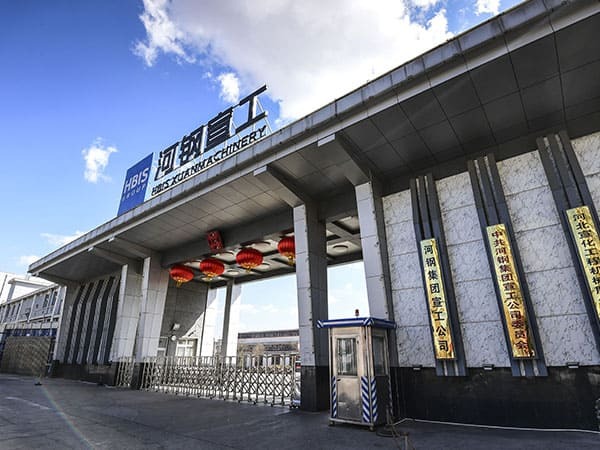 Now it has become a state-owned public company, a leading manufacturer of bulldozer, HBXG locates in Xuanhua, a historic city in the Northwestern of Hebei Province with only 175 kilometers away from Beijing, capital of China. In 2010, the HBXG was incorporated by HBIS Group Co., Ltd (hereinafter referred to as HBIS). HBIS is also a large-scale, state owned, public company，the top 500 enterprises all over the world. Centering on steel making, we are also involved in mineral resources, financial services, modern logistics, iron & steel trade and equipment manufacturing. By this incorporation, HBXG become a subsidiary of HBIS, and merge the advanced philosophy and share the advantages of HBIS with respect to management, funds and market，paving the way & solid foundation for rapid development of HBXG. "HBXG" and "SHEHWA" brand bulldozers were awarded honorable name as "Top Brand of China", "Excellent Brand of China" etc. HBXG owns more than 20 items of state patent, state-grade research & Development Center with a strong professional team, gets the approvals of the ISO 9001 quality control system registration and the State measurement control system registration, possesses more than 1200 sets of high-tech and high-precision equipments. Currently the products of HBXG covers full serial of bulldozers ranged from 130HP to 430HP. Among them, the serial models of T140, T165, TY165-2, SD6G occupy a stable market share in the domestic and abroad market, and serial models of SD7(230HP), SD8B(320HP), SD9(430HP) are elevated sprocket bulldozer with advanced technology in China. The elevated sprocket bulldozer is the representative of the most advanced technology and the highest level of fabrication in the field of international bulldozer industry. HBXG is the exclusive manufacturer of elevated sprocket bulldozer in China with the grasp of the essential technology and realization of the batch output. Reasonable designing and function units arrangement enable the elevated sprocket bulldozer features the characteristics of high quality, high durability, easy-maintenance& repairing etc. HBXG implements the science& technology innovation program according to the integrated strategy of "Production, Study, Research, Realization", solve and break through the technology bottleneck, improve the designing ability and lever greatly. In 2011, HBXG developed the world advanced electric hydraulic control SD7K bulldozer, SD9 bulldozer achieves the National Important New Products Certificate and Province Science and Technology Awards. SD8 bulldozer achieves the International Standard Approving Certificate. SD8 land reclamation bulldozer achieves the Hebei province Metallurgy Science and Technology Awards. HBXG adheres to the marketing philosophy: "Oriented by the markets, focusing the customers as core", implements integrated operation &management model covering business、spare parts and services, to set up a rapidly responding mechanism with high working efficiency, prompt services. HBXG has set up more than 30 branches throughout China, and established long-term strategic &cooperative partnership with more than 50 professional dealers. The marketing &service network covers whole country, products do as same, and being exported to Russia, South-America, Africa, Middle-east region etc, total more than 90 countries and regions, and built up a long-term strategic &cooperative partnership with the local dealers. HBXG will follow the principle of wholly programming, sequentially &gradually forwarding, orderly developing, to greatly promote the development of five industries involving in construction machinery、mining machinery、metallurgical &environment-protection machinery、casting & key parts、steel deep-processing etc.,and make great efforts to forge HBXG becoming a modern equipment manufacture enterprise with the position of leading-domestic, international first-class, integrated the engineering、mining machinery、metallurgical & environment-protection machinery.